The global lighting as a service market is expected to reach $4.74 billion by 2025. The market is growing due to the increasing demand of energy efficient lighting systems. Growing implementation of Internet of Things (IoT) with lighting services is also expected to increase the adoption of this service across the globe. The report is a compilation of various segments including market dynamics, market breakdown by application and by geography. The report provides a comprehensive market analysis and forecast along with the recent trends influencing the markets. While highlighting the key driving and restraining forces for this market, the report also provides a detailed study of the future trends and developments of the market. It also examines the role of the leading market players involved in the industry including their corporate overview and SWOT analysis. • What are the major market drivers, challenges and opportunities in the global lighting as a service market? 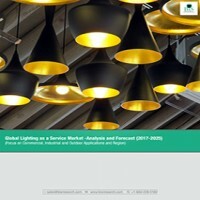 • How the lighting as a service market will evolve and what is its scope in the future? • What was the market share of the leading segments and sub-segments of the global lighting as a service market in 2016 and what will be the shares in 2025? • How will each segment of the global lighting as a service market grow during the forecast period and what will be the revenue generated by each of the segments by the end of 2025? • Which geographical location will dominate the lighting as a service market? • Who are the key players in the lighting as a service market? • What major opportunities do the lighting as a service companies foresee? • What strategies are adopted by the lighting as a service providers to sustain or grow in the market? • What are the major projects done by the lighting as a service providers? The company profiles section of the report includes highlights of significant information about the key companies involved along with their corporate overview, SWOT analysis, key strategies & developmental activities of the recent years (2015-2017). Some of the key players are Philips Lighting, General Electric Lighting, Acuity Brands Lighting, Sparkfund, Enlighted and Zumtobel Group. The LED lights market has undergone significant transformation in the last couple of years. The Energy Independence and Security Act (EISA) passed in 2007 led to a major change in the lighting industry as it replaced the outdated inefficient lighting technology. LED lighting has now become necessary to meet the new standards of EISA’s energy standards. The adoption of LED lighting systems led to reduced energy costs and significant improvements in performance. However, installation of LED based lighting system require high up front cost, which led to the development of new financial structures such as Lighting as a Service (LAAS). These new financial structures have helped both the public and private sector companies capitalize on continuous innovations that are taking place in the LED industry. Global lighting as a service market is expected to reach $4.74 billion by 2025. In terms of Geography, North America had the largest market share in 2016. The growth of the North American lighting as a service market is primarily attributed to the factors such as presence of the market leaders in the lighting industry and government’s policy to reduce energy consumption in the region by replacing old lighting with the more efficient LED lighting. In terms of application, the Commercial segment would dominate the market throughout the forecast period and would also register the highest growth during the forecast period. This growth can be attributed to widespread adoption of this business model by various commercial organizations as it offers enhanced energy savings and cost reductions. Some of the key players are Philips Lighting, General Electric Lighting, Acuity Brands Lighting, Sparkfund, Enlighted and Zumtobel Group. These companies are actively aiming for an increased participation through partnerships and collaborations in order to expand their operations and offerings to target potential clientele.